Baden-Powell is well known to Scouters for his many drawings illustrating Scouting for Boys and Aids to Scoutmastership. He was an accomplished artist and most of his published works are illustrated with his own drawings and in some case, color plates from his paintings. 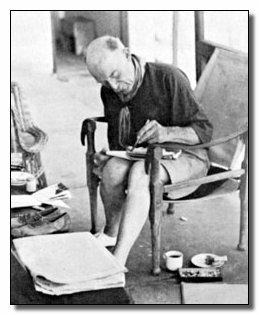 His notebooks, diaries, journals and letters are reported to be filled with pen and ink drawings, and both pencil and water-color sketches. Here is a small collection of illustrations of his paintings from a variety of sources. "The Prince of Wales Winning the Hog-Hunter’s Cup" [54K] is one of four water-color illustrations by Baden-Powell from Pig-Sticking or Hog-Hunting, 2nd Edition, 1924. Others include: "A Boar in the Bazaar" [48K], "The Line of Beaters" [56K], and "The Sideways Pop" [43K]. Two of a series of five designs painted by Lord Baden-Powell produced as UNICEF greeting cards for the World Scout Movement by UNICEF, the United Nations Childrens Emergency Fund to commemorate the International Year of the Child in 1979. "Zebras at a Water Hole" [54K] and "African Antelope Grazing" [60K]. Paintings from Baden-Powell, Birds and Beasts in Africa, 1938. A collection of stories about B-P’s home in Nyeri, the book is illlustrated with a series of wonderful paintings of scenes in and around the B-P’s home at Paxtu. "Are You In This?" A World War I poster by Baden Powell from the collection of the Library of Congress, Washington. "Scouts of the World–Brothers Together"